In today's roundup of the most interesting stories in tech – courtesy of our friends at TechRadar – we've got details on not one, not two, but three of the best phones of 2018 (potentially). There's a rebrand for Android Wear too, and another VR headset launch. They're going to be appearing in a lot of "best smartphone of 2018" lists, and today you can walk right into a shop and buy a Galaxy S9 or a Galaxy S9 Plus for yourself (or just click around the web and order one online instead). If you're deciding to take the plunge, you'll need to part with £739 ($719.99, AU$1,199) for the smaller model, or £869 ($839.99, AU$1,349) for the larger one. There's not much to choose between them, except the size. 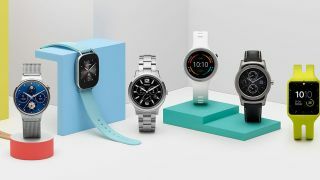 Google has decided to do some rebranding for its smartwatch line – what you previously knew as Android Wear is now called Wear OS, in part to increase the appeal for iPhone owners after a wearable. We don't have much in the way of new features for the rebranded OS, but we do have a list of watches that are going to get the next Wear OS software update. With the Baselworld watch expo coming up, keep an eye out for new devices. It seems as though there's a new Huawei P20 leak every day at the moment – the phone is expected to officially make its debut on 27 March – and for today's instalment we have a few photo samples that have made their way on to the web. The pictures certainly look impressive, but then you would expect that from a phone as good as the P20 is expected to be. In a couple of weeks' time, we'll know for sure what the Huawei P20 line has to offer. We're still in the early stages of the virtual reality revolution, but more hardware continues to appear on the scene. For today's news digest we've got a tip-off about the Lenovo Mirage Solo VR, expected to launch this year for less than $400 (roughly £285) – apparently it's going to go on sale on 11 May, right after Google's developer conference (which would make sense). Stay tuned for more details when the headset finally sees the light of day. We've already seen a 2018 flagship launch from Samsung, and Huawei will shortly follow suit. HTC could be next in line to show off its new hardware for this year, and a fresh leak has told us just about everything we could want to know about the upcoming HTC U12 Plus: it's going to feature a 6-inch WQHD+ screen, the Snapdragon 845 chipset, and a hefty 6GB of RAM. Meanwhile, there will be a 16MP+12MP dual-lens camera around the back.